The Urban Redevelopment Authority (URA) released today the real estate statistics for 2nd Quarter 2018. The real estate statistics showed that prices of private residential properties increased by 3.4% in 2nd Quarter 2018, compared with the 3.9% increase in the previous quarter. Prices of landed properties rose by 4.1% in 2nd Quarter 2018, compared with the 1.9% increase in the previous quarter. 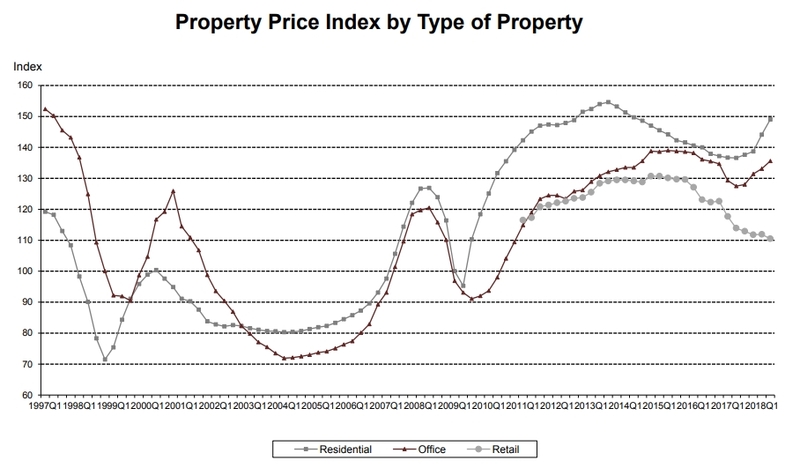 Prices of non-landed properties rose by 3.2%, compared with the 4.4% increase in the previous quarter. Prices of non-landed properties in Core Central Region (CCR) increased by 0.9% in 2nd Quarter 2018, compared with the 5.5% increase in the previous quarter. Prices of non-landed properties in Rest of Central Region (RCR) increased by 5.6%, compared with the 1.2% increase in the previous quarter. Prices of non-landed properties in Outside Central Region (OCR) increased by 3.0%, compared with the 5.6% increase in the previous quarter. Rentals of private residential properties increased by 1.0% in 2nd Quarter 2018, compared with the 0.3% increase in the previous quarter. Rentals of landed properties increased by 3.6% in 2nd Quarter 2018, after remaining unchanged in the previous quarter. Rentals of non-landed properties increased by 0.6%, compared with the 0.3% increase in the previous quarter. Rentals of non-landed properties in CCR increased by 0.8%, compared with the 0.6% increase in the previous quarter. Rentals in RCR increased by 0.4%, compared with the 0.3% decrease in the previous quarter. Rentals in OCR increased by 0.8%, compared with the 0.7% increase in the previous quarter. The real estate statistics showed that developers launched 2,437 uncompleted private residential units (excluding Executive Condominiums [EC]) for sale in 2nd Quarter 2018, compared with 921 units in the previous quarter. Developers sold 2,366 private residential units (excluding ECs) in 2nd Quarter 2018, compared with the 1,581 units sold in the previous quarter. Developers launched 628 EC units for sale in 2nd Quarter 2018. 762 EC units were sold in the quarter. In comparison, developers did not launch any EC units and sold 261 EC units in the previous quarter. Who are the big gainers and losers after the new property cooling measures announcement? There were 4,700 resale transactions in 2nd Quarter 2018, compared with the 3,666 units transacted in the previous quarter, the published real estate statistics said. Resale transactions accounted for 65.4% of all sale transactions in 2nd Quarter 2018, compared with 68.8% in the previous quarter. There were 120 sub-sale transactions in 2nd Quarter 2018, compared with the 81 units transacted in the previous quarter. Sub-sales accounted for 1.7% of all sale transactions in 2nd Quarter 2018, compared with 1.5% in the previous quarter. As at the end of 2nd Quarter 2018, there was a total supply of 45,003 uncompleted private residential units (excluding ECs) in the pipeline with planning approvals3, compared with the 40,330 units in the previous quarter. Of this number, 26,943 units remained unsold as at the end of 2nd Quarter 2018, up from 23,514 units in the previous quarter. After adding the supply of 2,518 EC units in the pipeline, there were 47,521 units in the pipeline with planning approvals. Of the EC units in the pipeline, 18 units remained unsold. In total, 26,961 units with planning approvals (including ECs) remained unsold, up from 24,193 units in the previous quarter. URA’s real estate statistics showed that based on the expected completion dates reported by developers, 7,130 units (including ECs) will be completed in the second half of 2018 and another 9,510 units (including ECs) will be completed in 2019. The redevelopment of the large number of private residential developments sold en-bloc since 2016 will add a significant number of new housing units to the supply pipeline, URA said. As at the end of 2nd Quarter 2018, there were 26,961 unsold units with planning approval5, up from 24,193 units as at the end of 1st Quarter 2018. In addition, there is a potential supply of 19,500 units (including ECs) from Government Land Sales (GLS) sites and awarded en-bloc sale sites that have not been granted planning approval yet. They comprise of about 8,400 units from awarded GLS sites and Confirmed List sites that have not been awarded yet, and about 11,100 units from awarded en-bloc sale sites. A large part of this new supply of 19,500 units could be made available for sale later this year or next year, and will be completed from 2021 onwards. The stock of completed private residential units (excluding ECs) increased by 1,152 units in 2nd Quarter 2018, compared with an increase of 1,296 units in the previous quarter. The stock of occupied private residential units (excluding ECs) increased by 1,994 units in 2nd Quarter 2018, compared with an increase of 2,950 units in the previous quarter. As a result, the vacancy rate of completed private residential units (excluding ECs) decreased to 7.1% at the end of 2nd Quarter 2018, compared with 7.4% in the previous quarter. Vacancy rates of completed private residential properties at the end of 2nd Quarter 2018 in CCR, RCR and OCR were 10.9%, 7.7% and 5.0% respectively, compared with the 11.6%, 8.3% and 4.9% in the previous quarter. The real estate statistics showed that prices of office space increased by 1.9% in 2nd Quarter 2018, compared with the 1.3% increase in the previous quarter. Rentals of office space increased by 1.6% in 2nd Quarter 2018, compared with the 2.6% increase in the previous quarter. As at the end of 2nd Quarter 2018, there was a total supply of about 725,000 sq m GFA of office space in the pipeline, compared with the 791,000 sq m GFA of office space in the pipeline in the previous quarter. The amount of occupied office space increased by 74,000 sq m (nett) in 2nd Quarter 2018, compared with the increase of 14,000 sq m (nett) in the previous quarter. The stock of office space increased by 60,000 sq m (nett) in 2nd Quarter 2018, compared with the increase of 11,000 sq m (nett) in the previous quarter. As a result, the island-wide vacancy rate of office space dropped to 12.2% at the end of 2nd Quarter 2018, from 12.5% at the end of the previous quarter. Prices of retail space decreased by 1.3% in 2nd Quarter 2018, compared with the increase of 0.1% in the previous quarter, said the real estate statistics. Rentals of retail space decreased by 1.1% in 2nd Quarter 2018, compared with the increase of 0.1% in the previous quarter. As at the end of 2nd Quarter 2018, there was a total supply of 498,000 sq m GFA of retail space from projects in the pipeline, compared with the 530,000 sq m GFA of retail space in the pipeline in the previous quarter. The amount of occupied retail space increased by 21,000 sq m (nett) in 2nd Quarter 2018, after remaining unchanged in the previous quarter. The stock of retail space increased by 10,000 sq m (nett) in 2nd Quarter 2018, compared with the increase of 11,000 sq m (nett) in the previous quarter. As a result, the island-wide vacancy rate of retail space decreased to 7.3% at the end of 2nd Quarter 2018, from 7.5% at the end of the previous quarter. If you are home hunting, our Panel of Property agents and the mortgage consultants at icompareloan.com can help you with affordability assessment and a promotional home loan.